Now what's only missing is a proper gearbox. 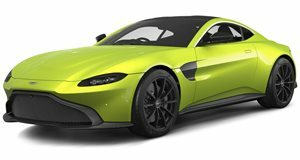 The formula for the Aston Martin V12 Vantage S is simple: stuff a 5.9-liter V12 into the smallest chassis in the automaker’s lineup. With 565 horsepower on hand, the Vantage is larger than a Subaru BRZ but smaller than a Ford Mustang. It’s an absolute beast and there’s only one other AM that’s faster going from 0-60: the One-77. Remember, the Vantage was originally designed with a V8, thus making the V12 model all the more insane. Perhaps its biggest fault is its single-clutch automated manual gearbox - its shift times are just too damn slow. Would a dual-clutch be the best fix to make this the ultimate Aston Martin you can buy today? It’s entirely possible but since AM doesn’t even offer a dual-clutch in any of its models, we’ll never know.